Yes! Heineken Beer bottles, in fact. Very beautiful when viewed up close! Welcome to The WELL’s lobby. Now look down. A LEED Gold Award plaque adorns a wall in The WELL. 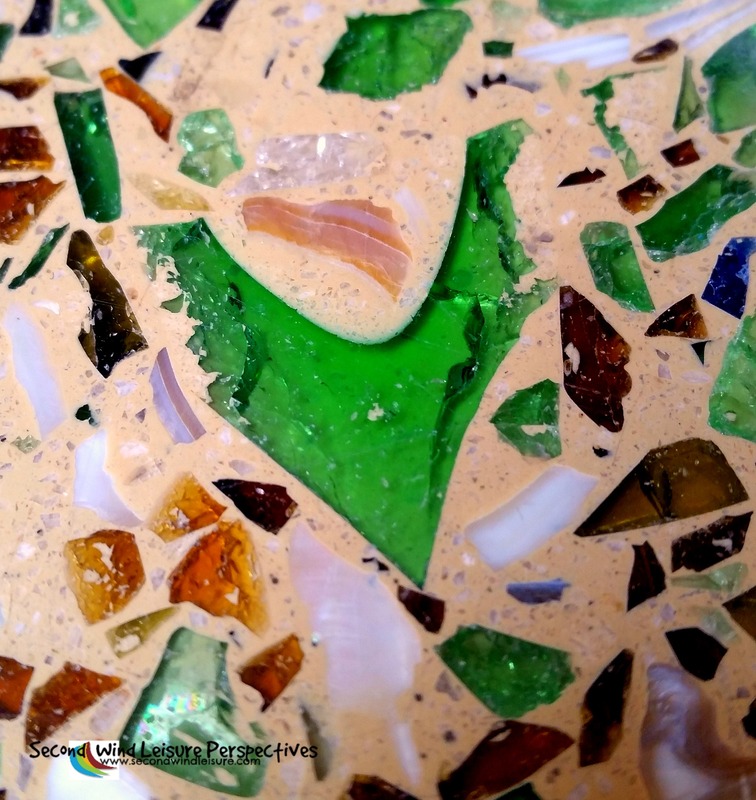 The unique green chips in the lobby’s terrazzo floor are made up of recycled Heineken bottles that were crushed and put into the mix. The entrance atrium has a 40-foot-wide skylight made of a special material that helps regulate building temperature. The building’s north-south orientation ensures that the main entrances will not be exposed to direct sunlight. Multiple windows and skylights eliminate the need for artificial lighting during the day. The primary ingredient in the gymnasium walls is sunflower seeds. LEED, or Leadership in Energy and Environmental Design, is changing the way we think about how buildings and communities are planned, constructed, maintained and operated. LEED-certified buildings are resource efficient. They use less water and energy and reduce greenhouse gas emissions. A very good use of recycled beer bottles! Kudos to Sacramento State University, a campus in which I was both a student, and now faculty, for being GREEN! Join the WordPress Weekly Photo Challenge any time! When I saw your post I had to comment that the street I grew up on was repaved with recycled bottles. I thought it was amazing and created such a beautiful sparkle at night. 10 green bottles hanging on the wall, Terri. Art, like this, deserves full credit for the recycling element and the beauty it can portray to something we often find dull and wouldn’t take a second glance at. I’ve seen wall tiles with similar themes. Very clever and, I’m guessing, very eye-catching when daylight or the sun shines on it? I was so happy to be on campus when I read the prompt! It does need to be viewed up close to really appreciate it. The whole facility is really striking! It is so funny that I was just talking about this at a party, and here you have posted a blog on it. That IS funny! Great minds and all, right? I should have asked how many bottle were used! LOVE the floor! What a great idea (both to use the beer bottles, and to choose this topic for your weekly photo challenge). Very inspiring! Thanks, Donna, I was happy to be at school when I read the prompt. I hustled over to the Well and took a few photos! What a wonderful place, Terri and great interpretation of the theme. Great floor and good use of colorful bottles! I worked in a LEED Double Platinum building (for its construction and ongoing energy savings and sustainability practices after it was completed) for several years before I retired. It really was a special building and we were all very proud to work there. Thanks, Janis, wow! Double platinum! I hope more new buildings use these ideals! Yes, I should hope so! Very cool concept, Terri! Colorful, artistic and modern as well. And a great topic for the weekly photo challenge! I think these kind of ways to recycle is something everyone should get on board with—how inventive. I wouldn’t mind being on the team that had to drink the beers—ha ha!! And did they get a California recycling fee also 🙂 Good stuff! !